Agile allows companies to innovate at a much faster rate while at the same time, agile teams are separate and often independent of one another. So how can you effectively track progress for teams? Many agile teams choose to share a burndown chart to provide a visual representation of how work progresses over time. Burndown Charts in Targetprocess show the ratio of the amount of work remaining in a sprint and the remaining time to complete the sprint. In Targetprocess’ Burndown Chart, time remaining is shown on the vertical axis of the chart, and timeline on the horizontal axis. This chart gives an actual forecast of when you can expect all planned work to be completed. It also shows the actual velocity - the average amount of work done by a team over a given period of time. Apart from that, you can see details on how the work progresses along with daily metrics. When an Iteration or a Release is in progress, simply look at the Burndown chart and fix scope creep, add/remove tasks from the backlog and more. The detailed progress information is broken down into days for Iterations (Sprints), and into weeks for Releases. The Burndown Chart is mostly used in agile software development processes like Scrum. However, Burndown Charts can be applied to any project where progress is measured over time. To access this chart, please navigate to the main (top) menu -> Reports -> Burn Down. Also, you can find a link to the Burndown Chart column headers for Iterations and Releases on Board Views. The Actual progress line shows how much work remains for a given time (remaining work). At the start point, it shows the initial scope of work. Then, day by day, new points are added to the line on the right. When work is completed or removed from the scope, there's less time remaining and the line goes down. If there's no progress, time remaining stays unchanged, and the line becomes flat. When work is added to the scope, time remaining increases, and the line goes up. This chart keeps track of all changes. Ideally, all the tasks are completed in the given timeframe, and the line reaches zero. 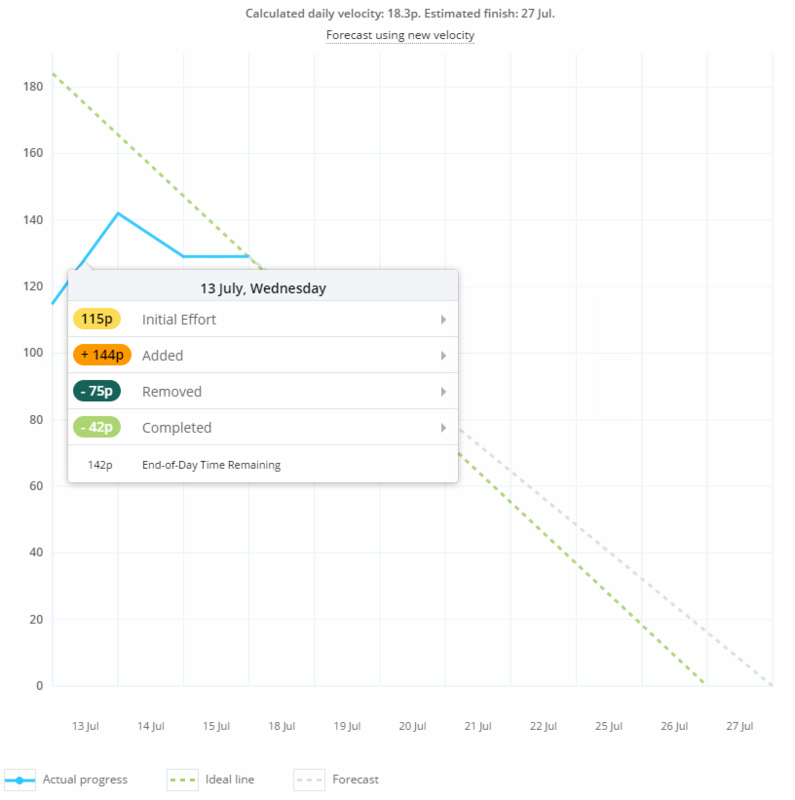 By clicking on a segment of the Actual progress line, you open a pop-up with the detailed progress overview and updates for a given day (or a given week for Release Burndown Chart). You can see Start-of-Day Time Remaining, Added, Removed and Completed time, and End-of-Day Time Remaining. Each line with totals is clickable and you can see work that was added/removed/completed. How to measure performance with the Ideal line? The Ideal line gives you an idea of how quickly work should be completed so that all work is completed on time. At the beginning of an Iteration or a Release, the start point of the Ideal line shows the estimated total for all remaining work. As you progress and re-estimate the planned backlog, the line is redrawn. If you add new work or increase time remaining, the start point of the line moves higher. When you remove work or decrease time remaining, it moves lower. Remaining, added and removed values here are summarized across all time range. At the endpoint, the Ideal line burns down to where all the work should be completed. The endpoint is the last day of an Iteration / Sprint, or the last week for a Release. Some people have issues calling this “Ideal” line, as it's not generally true that the goal is to stick to it as the project progresses. This line is an estimate-based, mathematical calculation, and estimates usually differ from actual progress. In the real world, the Actual progress line goes up and down along the Ideal line depending on how accurate the estimate, how effective the team and how estimates/scope change. If the Actual work line is below the Ideal line, the team is working faster than expected, and the project is ahead of schedule. If the Actual work line is above the Ideal line, the team is working slower than expected, and the project is behind schedule. Daily velocity is the average daily total completed work, in points or hours, for the elapsed time shown on the Burndown Chart timeline. Note that daily velocity is not the metric that is normally used in agile software development. There's no point in sticking to daily velocity, and it can be misleading. Use these stats for high-level planning only. If you want to know the team's velocity for a certain time period, multiply the daily velocity by days. Obviously, when you add more work or increase time remaining, the Forecast end date is recalculated and shifted forward. When you remove tasks from your backlog or decrease the estimated times, the opposite is true. When an Iteration / Sprint is in the past, 3 extra days are added to the Burndown Chart timeline. This helps you see monitor the scope beyond the actual Iteration / Sprint finish date. An entity is moved into final (last) workflow state. Usually, its name is 'Done' or 'Closed'. When the browsing scope is a Team Iteration and work items assigned to the Team follow an explicit Team Workflow, then Team Workflow states and roles settings are used for Burndown calculation. A work item is shown in the chart when at least one role with estimated effort is covered by a non-final state of the mapped team workflow. Multiple final states are not currently supported by Team Workflows. The last Team Workflow state is considered final. The rule works even when many Team Workflow states are mapped to a single final Project Workflow state. If you need multiple final states, you can use 'Drop Down List' custom fields. Add a custom field named 'Resolution' or 'Final State Name' to your assignable entities. Fill in the options of the field with all possible resolutions (names of final states). Provide a default option for the field. Use single Team Workflow state as the final one. Whenever an entity enters the last Team Workflow state, select one of the non-default final state names in the 'Resolution' / 'Final State Name' custom field of the entity if required. Q: What entity fields are being used for the burndown reports? A: Burndown Chart is based on Effort fields. The Effort for a User Story is a sum of Role Efforts (Dev effort + QA effort etc.). Time spent data is not taken into account by burndown directly. However when "ideal hours" mode is used, the ratio between time spent / (time spent + time remain) helps to define the percentage of progress. The Effort of a user story is multiplied by this percentage and then shown on the burndown. Q: I've removed weekends from the chart. Will that effect forecast finish date? A: Yes. The chart makes no distinction of weekdays and weekends. If weekends are removed from the chart, the forecast end date will shift. You can remove weekends from the chart altogether. Q: Our Actual progress line starts at 0. How do we make the chart look like a real descending Burndown, with no spikes in the beginning? A: When starting an iteration with an empty backlog and you spending several days on planning before the team makes progress, such a spike is normal. If you want to avoid spikes, set the Start Date to the first day of when Actual progress is made. Q: We don't use Iterations, and we need days in the Release Burndown, but it only shows weeks now. What can we do? A: The tool does not currently support this feature. If your Release spans across a single Project and you do not use Iterations, then a workaround is possible. Create an Iteration, with the same time frame as the Release, e.g. 30 days. Then, assign your work to this inner Iteration first - and it will be assigned to the outer Release automatically. The Iteration Burndown Chart will track detailed daily updates for a Release. Reopened entities are displayed on the chart as added once again. Their effort is included in the "Added" scope and Ideal line calculation every time the entity is reopened. The chart cannot recognize reopened items and does not show them as newly added at the moment. The Iteration / Sprint / Release contains previously done work. However, Start date for the Iteration / Sprint / Release is set to a future date. Please edit the date and set it to the day when work began. Targetprocess is an end-to-end product management solution for agile companies that allows you to create visual roadmaps, manage, assign tasks to individuals and teams, and create stellar and robust sprint Burndown Charts in just a few clicks.